The seventh annual Arctic Report Card released by NOAA finds the rapid melting underway in northern lands and waters is unlikely to diminish in the face of continued global warming. The single biggest finding: Despite fewer weird warm spells in the Arctic in 2012, compared to the past ten warm years, snow and ice extent continued to melt at a record-breaking pace. Ominously a new mechanism seems to be driving these changes. Disappearing ice and snow no longer reflect as much sunlight from the Earth. Meanwhile increasingly open waters and snow-free lands absorb more sunlight. This creates a self-reinforcing cycle of continued melting even during cooler times. It bodes poorly for recovery or stability in the far north. It is mind-boggling how quickly the Arctic system is changing and how unstable it appears to be. It is clear that there are strong, disturbing trends, but it is also evident how complex the system is and hence how hard it is to predict what all the consequences will be. In some ways I feel that the scientific community simply can’t respond quickly enough to sort all these issues out. 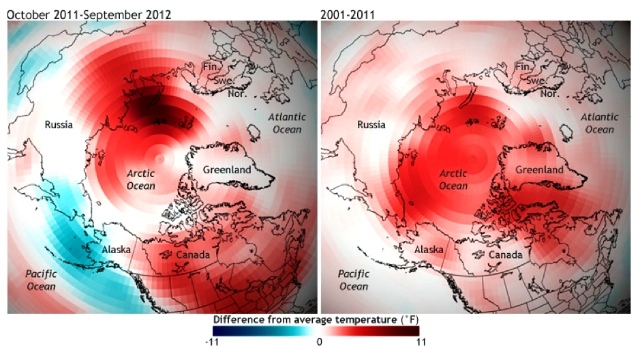 The 2012 Arctic Report Card is another stark reminder of how quickly the Arctic is charging. Sea ice extent is diminishing in summer at an unprecedented rate and we do not yet understand the biological consequences for other stressors such as ocean acidification. While there is no base-line left to study in the Arctic we should increase our efforts to monitor and anticipate how the rapid changes we our observing today will impact high latitude ecosystems and the charismatic megafauna that they support. Global warming is amplified in the Arctic, where no part of was cooler than the long-term average in the past decade: NOAA climate.gov teamStay tuned. I’ll be writing more in-depth about other changes in NOAA’s Arctic Report Card in the coming days.